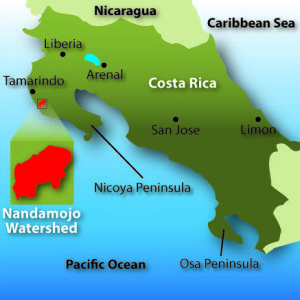 The Nandamojo watershed is located on Costa Rica’s northwest coast in the province of Guanacaste. The watershed encompasses 29,000 acres, from the community of 27 de abril to Playa Junquillal, where the river empties into the sea. More than any other factor, it is climate that defines the challenges and opportunities in this part of Costa Rica. Temperatures can climb over 100 degrees and there are two distinct seasons: wet and dry. The winter dry season, which starts in November, is caused by trade winds that blow in from the Caribbean. As this air moves west across the country it loses moisture, reaching Guanacaste as a gusty dry wind that desicrates the landscape. In May, the trade winds shift and allow offshore weather from the Pacific to bring afternoon showers and humidity. For the next six months, rivers and lowlands areas are filled with water and the landscape is a jungle of green. This “tropical dry forest” supports a unique ecosystem of flora and fauna. Geography as well as climate has influenced human activity in this region. Guanacaste was sparsely settled until the 1900s, and the agricultural communities in the Nandamojo River Valley were largely isolated from the rest of the country. Fertile lowlands, ample drinking water in the dry season and nearby forests teeming with wildlife sustained a self sufficient rural population that actually exported grains, livestock and timber to the country’s metropolitan areas. In the 1950s and 60s, US demand for cheap hamburger provided an irresistible economic opportunity for the region. 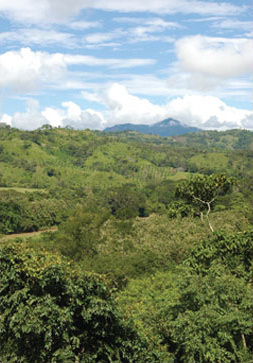 Much of the land in Guanacaste was cleared by fire to create grazing land for millions of beef cattle. Without trees and native grasses to protect it from wind and rain, the land eroded quickly. Fertile valleys were carpeted with a non-permeable layer of fine silt; swamps and estuaries filled with debris and could no longer absorb seasonal fluctuations in rainfall; the water table fell. As the seasons between the rains grew longer and hotter, many rivers, including the Nandamojo, began to dry up for part of the year. These changes, combined with development pressures that began in the 1970, have dramatically altered the region’s ecology, economy and social fabric. Most food is now imported from other parts of the country or from overseas. Land-based traditions are fast disappearing and a wealth of indigenous technical knowledge has been neglected. Elders in the region still remember when the Rio Nandamojo flowed year-round. When the valley was fertile and the forests teemed with birds and other wildlife. When food was produced locally and people could earn a livelihood in their own community. 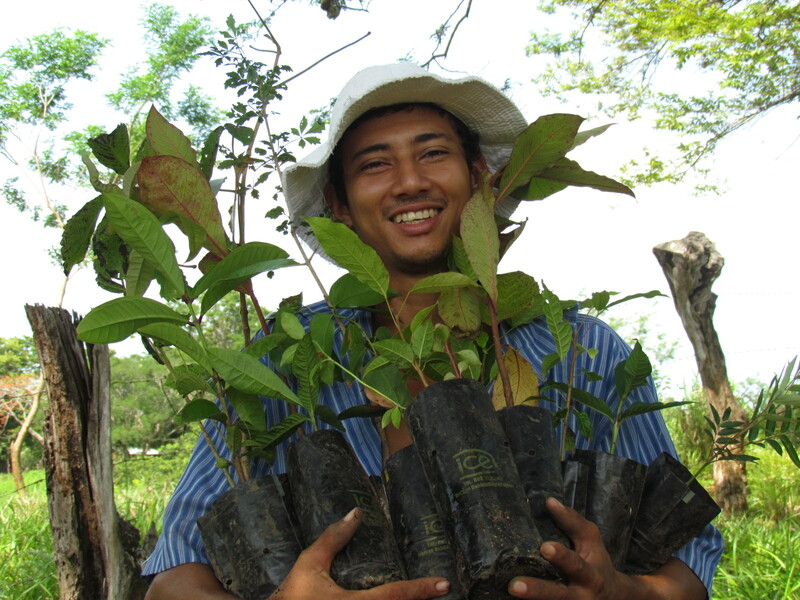 Restoring that memory is a guiding vision for our work in the watershed.